You might have heard this incredible, high powered all female-band on Sirius satellite radio with their song GONE ranking #2 for 15 consecutive weeks on The Hot Top 20 Charts. Perhaps you have seen them on the DIY Ten Grand in Your Hand reality show, “Renovation Rock” episode or on Showtime’s smash hit The L-Word, performing LIVE on an Olivia Cruise. If not then I am sure you have seen them ignite stages from coast to coast, including Canada. July 2011, Sister Funk was recognized for their 10+ yr commitment and accomplishments in music and was inducted into the Women’s Hall Of Fame in Seneca NY. A plaque in their honor can be viewed on the impressive walls with other remarkable women from yesterday and today! CURVE Magazine describes Sister Funk as “provocative, high energy, and entertaining, these women put on a hot show”. This 2009 Red Door battle of the band winner smashed the competition taking 1st place in every category during the 9 week battle, taking home the GRAND PRIZE cash money & studio time. Who says women’s can’t rock? 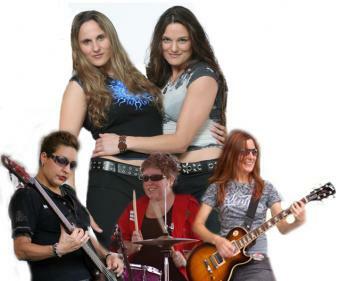 According to Conch Key West Chronicle, “Sister Funk, this incredible all-girl rock group, absolutely stunned hundreds of concert-goers on Duval St., proving themselves not only the hottest all girl group to hit the Southernmost City but impressed even seasoned rockaholics”. Don’t let the name fool you, these girls do more than funk! Experience them for yourself and get ready for a heaping spoonful of undeniable entertainment!